I skipped from Hong Kong to Tokyo to spend 6 days. I was pretty exhausted when I left Hong Kong and I caught a bit of a head cold upon arrival since it was freezing and rainy in Tokyo. Yeah, I'm a SoCal girl so 40ish degrees Fahrenheit gets me shivering. Anyway, I forged on because there was delicious Japanese food to be eaten! 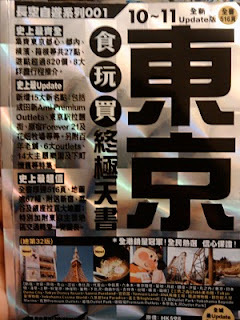 While I was in Hong Kong, I picked up this super useful Tokyo guidebook: Tokyo Eat Play Shop Ultimate Heaven Book. That's my best attempt at translating the Chinese title; the term "Heaven Book" in Chinese is just a way to say it's the ultimate source book. I'm so thankful I can read Chinese because this guidebook was really, really helpful in pointing me to all the good eats, sites to visit and interesting shopping destinations. I found it much more focused and detailed and more attuned to my tastes than English guidebooks. Most of my good eats recommendations came from this book. If you're in Hong Kong and can read traditional Chinese, I recommend you visit a 7-Eleven and check out all the titles they have, or heck, have a Hong Kong friend mail you a copy. There are many editions on cities in China and throughout Asia. Santouka is famous for its delicious ramen bathed in its rich pork bone broth. I got the salt special pork ramen which came with extra fatty and tender pork on the side, "wood-ear" mushrooms and a perfect hardboiled egg with a runny yolk. All bowls of ramen at Santouka are topped with a spoonful of oil to seal in the heat of the soup. There are several Santouka locations in Los Angeles and I after trying this Tokyo location, I think the LA ones are just as good and preferable because it's cheaper. My bowl in Tokyo cost me $16 USD! All that salt from the ramen made me crave sugar so I immediately stopped when I spotted a random dessert shop in Shinjuku. I got a 3-course prix fixe. The best was the red bean cake with fresh sweet whipped cream. The mochi swimming in the red bean soup was okay. I didn't care for the mochi wrapped in seaweed that was in the middle; savory mochi isn't my thing. Chicken Curry from Nakamuraya in Shinjuku. The curry was perfect with the chewy short-grain jasmine rice. In addition to its curry, Nakamuraya is also know for its creme bread (top rack) in its bakery section. It has a daily schedule and people queue up at the designated times for a hot piping creme bread. It was soooo good. Asakusa is a district in Tokyo (about 20 min train ride from city center) most famous for the Sensoji Temple, the oldest temple in Tokyo. Just outside of the Sensoji Temple is a long avenue of snack vendors. I pretty much hit all the highlights. This is a fried "mantou" bread - it's sort of like a donut I guess. The orange one has sweet pumpkin filling and the green one was green tea. The pumpkin was really good. "Human Shaped Burns" - that's my straight translation of this fabulous snack. It's really animal and architecture shaped breads with a smooth, sweet red bean filling inside. Fresh hot ones are constantly being made so get a hot one and cooled ones can also be bought as gifts but they don't last beyond a day or two. The highlight here are those light green rectangular cakes which are a kind of Japanese yam that' pureed and then formed into these blocks. (Sorry, can't find an English name for the yams.) I really enjoyed the delicate texture and light sweetness of this dessert snack. The flavor was subtle and not as bold as red bean. Hot sweet sake was so comforting on that cold, cold night in Asakusa. Broiled eel bento rice box at a restaurant (sorry, no English name) that specializes in broiled eel in Asakusa. The broiled eel went along perfectly with this eel liver soup. The soup was refreshing and had a hint of the crisp sweetness of the sea. A nice fluffy cake filled with sweet red beans in a shop that has been specializing in these cakes since 1924 in Asakusa. Red Bean Cake is one of my favorite Japanese snacks. Order ramen / food from a machine? This took me by surprise when I first saw it. You place your order at this machine and it gives you a ticket. You take the ticket and give it to someone in the restaurant, find a seat if seating is offered and then wait for your food to arrive (and hope that you really ordered what you thought you saw displayed on the picture). This was an awesome bowl of ramen - not ordered from a machine :). Located in Shinjuku, this ramen shop specializes in pork bone soup that's boiled for a full day. Oil is carefully removed from the soup to leave a milky rich broth that's sweet with meat flavors and not greasy. The ramen was the thinner variety, cooked al dente, and I loved the generous amounts of green onions, "wood-ear" mushrooms and thick cuts of tender pork char siu. The tonkatsu at Mai Sen in Harajuku is known for serving the best tonkatsu in Japan. The fried pork was bursting with juiciness and it was "melt in your mouth" tender. I never miss an opportunity to top something savory with an egg so I ordered a katsudon which is basically tonkatsu with an egg and a light sauce on top. The katsudon was so perfect. It's hard to find a good katsudon in LA; in my experience, the egg is often overcooked and combined with too much sauce, the pork becomes soggy and chewy. My friend and I actually managed to wake up at 4am to catch the 5:02am Oedo line to Tsukiji Fish Market to witness the amazing tuna auction. It was definitely worth the trip and it was quite an experience dodging trucks and boxes and barrels of fish in the humongous market. Note the size of the tuna and the men who are standing. I bet that large tuna in the front was bigger than me! The tuna auction finished around 6:15am so we quickly scrambled to find the two best sushi bars at Tsukiji: Sushi Dai and Sushi Daiwa. Both are located in the six mini side streets just next to the market. The lines were super long at both places and we decided on Sushi Dai because it has an 11-piece "Trust the Chef" sushi set for around $40 USD. Sushi Dai consists of only a bar and it only has 13 seats. We waited for almost 90 minutes. Sushi at for breakfast at 7:30am is actually pretty great! I normally don't like Red Snapper in LA because I find the taste dull. However, this one was really sweet; I would order Red Snapper in LA if it all tasted like that. The 11th piece on our set menu was up to our own choosing. The uni was so fresh and sweet that I chose a second order of uni over fatty tuna. Note that beautiful gold color and no black veins! I never order uni that has black veins running through the middle or if it's a very dull yellow. I've never had this before and was really surprised by how good it was. Again, I usually don't order raw shrimp in LA because it rarely tastes like anything but this one was really, really sweet. Yes to raw baby shrimp if they're all prepared and sweet like this. Mmmm, lots and lots of potential salmon...but so delicious as roe. A very simple tuna and cucumber roll mix. The chef used really good tuna for the roll and we could taste the difference. Interesting. In LA, I prefer Unagi (freshwater eel) over Anago because it's fattier but this Anago was very good - light in taste and it didn't fall apart when I picked it up even though the meat was very tender. This cooked piece was a great way to finish off a heavenly sushi experience. Everything is expensive in Tokyo and I have my priorities so most of my budget went to food over shopping. But six days was not enough to hit all the ramen shops on my "to eat" list and my Tokyo Eat Play Shop Ultimate Heaven Book gave me so many good ideas for restaurants in general that I'll just have to make a second trip back to Tokyo (and the rest of Japan) soon. I don't speak Japanese so there were many frustrating moments on this trip but knowing Chinese definitely helped when it came to reading Kanji since the Japanese writing system does borrow from Chinese characters. And it was a bummer that I had to leave when I finally got a handle on the Tokyo rail system (not easy!). Tokyo will overload every one of your senses.